The UsuryFree Eye Opener: Why is Usury the Root of All Evil and how will the OITC eliminate that Evil? Why is Usury the Root of All Evil and how will the OITC eliminate that Evil? Usury (the payment of interest on debt money) is the root of all evil because it enables bankers to steal the fruits of the labour of humanity and to own the resources and wealth of the whole world. Banksters create money out of nothing AND charge interest on that fictitious money. Moreover, that money creation is ONLY undertaken in response to requests for loans so it is really debt not money. (1) Thus, over time, banksters come to own everything. In 1694 a group of private individuals was granted a charter to establish the Bank of England in terms of a declared prospectus that: ‘Then bank hath the benefit of the interest on all monies which it creates out of nothing’. Since that time the practice has spread around the world until today bankers routinely create money out of thin air and charge interest (usury) on it. However, the real trick lies in the fact that the bankers NEVER EVER create the monies needed to pay the interest (usury) on the loan monies so created. Think about that. Money is only created when a borrower agrees to repay the amount of the principal sum borrowed PLUS interest on that principal sum for a specified period at the end of which time the principal and interest thereon must be paid in full. BUT, as money is only created into circulation through borrowing, and banks NEVER create any money to pay the interest on loan monies borrowed, THERE IS NEVER ENOUGH MONEY IN THE SYSTEM nor can there ever be. The Central Banks control the money supply by increasing and decreasing interest rates and providing or withholding “liquidity” by “lending” or withdrawing funds to commercial banks and increasing or decreasing the asset reserves commercial banks are required to hold in order to retain their licence to operate as a bank and "lend" fiat money. This enables the bankers to hold borrowers ie our entire global society, to ransom. This happened in 1929-33 and is happening again now. It also happens in parts of the world (eg Russia in the early 1990s; The South-East Asian nations during the “Asian Crisis” of 1997-8; and more recently in Argentina, Iceland et al. Banks harvest not only interest payments but also property as they foreclose on mortgages and loans whenever borrowers fail in their increasingly desperate bid to dredge up enough fiat money to pay interest on their loans along with repayment of the principal. This periodic “harvesting” is routine. Notable instances include the depressions in the US, Australia and other places in the early 1890s, the bank panic in New York in 1907; the Great Depression (1929-39); the oil crises and their aftermaths in 1973 and 1979; and the current global depression which is being masked by the humungous creation of fiat monies out of thin air which are being given to favoured big banks and corporations (but not spent on or by ordinary folks thus hiding from view the enormous inflationary potential of the money creation involved) so that stock markets are being fraudulently inflated and gold prices artificially held down by the banks that have been given this "bailout" money to play with. The fraudulent manipulation of stock, share, gold and commodities markets is masking the inexorable collapse of the US dollar so that the impending consequent enormous inflation of the price of necessities in the US remains temporarily hidden from general public consciousness. At the heart of all these bankster machinations is usury – the fact that bankers charge interest on monies they create out of thin air. 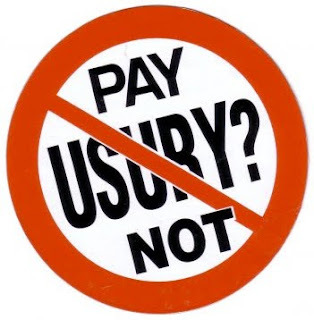 Without usury there would be little incentive or ability for bankers to distort nationalnand/or global money supply systems in order to create periodic booms andnbusts with a view to destroying wages and employment to create covert political control of society, while stealing the assets and fruits of the labour of workers and others. It is the ability to profit from receipt of interest payments charged on the essentially unproductive activity of money creation and supply that has distorted and corrupted both the global economy and global society. Accordingly usury HAS TO BE ELIMINATED. There is only one organization in the world with the capability and determination to eliminate usury. That organization is the OITC which has been established by the Royal Families of the world to administer the enormous real asset wealth those families accumulated over thousands of years and placed into the International Collateral Combined Accounts of the Global Debt Facility (Combined Accounts) originally set up by the Royal Families of the world in the 1880s and consistently enhanced ever since. Those assets and treasures were combined to ensure that all nations and all peoples and places in the world would be able to grow and prosper in true abundance. The aims of the Royal Families that created the Combined Accounts for the benefit of all mankind and all creatures on the planet (and hence planet Earth itself) were thwarted by the three nations – the US, UK and France – which were originally entrusted with the task by the Royal families. How so? However, the US, UK and France and their allies have continued to act as rogue nations attempting to keep stolen assets (and in some instances seeking to steal more) from the Combined Accounts; and covertly hindering the work of the OITC hiding behind the secrecy provisions in the various treaties that established the Combined Accounts and the OITC, as they seek to limit and even destroy the OITC’s global wealth creation initiatives. want and even abundance within three decades. Needless to say, the rogue governments and organizations that impede the work of the OITC are allied to and usually puppets of the banksters who are ruthlessly attempting to maintain their usurious global fiat money supply monopoly and fractional reserve banking system. The wealth in the Combined Accounts administered by the OITC is so enormous that it can easily rescue the entire world from its current credit crisis and creeping world depression and then restore to economic health and abundance all nations and peoples on Earth. That prospect spells the end of the power and wealth of the bankster elite and their henchmen and minions. And in due course that prospect will manifest in our reality. The OITC will eliminate usury by creating and allocating gold and platinum backed money, using the wealth in the Combined Accounts as collateral, to specifically identified organisations and projects in individual nations, with the money being earmarked for specified purposes and with use of the funding being strictly controlled and audited for purposes designed to benefit the people of that nation in real ways. Moreover, such monies will be earmarked to remain within the nation to which it is allocated, NO INTEREST WILL BE PAYABLE TO ANYONE FOR THAT MONEY, and it will be made available for long periods of time – typically 30 years. One does not have to be a monetary genius to comprehend that such practices, once widely adopted by the nations of the world and implemented by their peoples, will create uninterrupted full employment, prosperity and abundance for everyone in any nation fully accepting OITC assistance. It will also be obvious that this modus operandi will ELIMINATE USURY and PUT OUT OF BUSINESS banksters and the parasitic finance industries that batten on people who invest their hard earned savings in an effort to create financial security for their old age. So be it. Accordingly, the sooner the global population realises that the OITC can and will overturn the current bankster's monetary monopoly and consequent "death grip" on social, political and economic life in our world, the sooner we can all be free and prosperous. Banking will become what it should always have been, a minor service industry facilitating the safekeeping and availability of money for use in facilitating the exchange of goods and services within society. Banks will not indulge in deal making and entrepreneurial activities but will just be a basic service provider like any other, and they will only charge small genuine fees for service in much the same way that post offices do. Think about it folks. Once the wealth held for the benefit of all by the OITC can be freely distributed that is, once self-serving puppet politicians, bank executives and the plethora of Black Ops security agencies, financial gurus and so-called economic experts that live off the corrupt and usurious fiat money system have been sidelined, the world can be everyone’s oyster. The only limits on employment, productivity and prosperity will be the degree of hard work and initiative that people are prepared to put forth for the benefit of themselves and their community. Once the banksters have ceased to cream the bulk of human productivity off the top (remember not only do people have to pay interest on money under the current usurious system but also some 40% of the wages earned by most people goes to pay income taxes and the like in the US and most other nations) everyone will soon find life easier and freer and no longer a struggle. In the US and other places income taxes go straight to the banksters. Income tax monies are not used to provide facilities and services for US citizens. So, once the money creation and banking systems are changed THERE WILL BE NO NEED FOR INCOME TAXES. So be it. (3) Whenever a country has sought to resist having a Central Bank controlled by the Rothschild’s and their ilk the banksters punish them, usually by instigating revolutions (as for instance occurred when the Romanoff’s were overthrown by the Bolshevik Revolution in 1917) or a war (eg, as occurred in the US in 1812; with Germany in the 1930s and Iraq in 2003, when Hitler and Saddam Hussein respectively refused to accept the Rothschild’s’ central banking hegemony); or, as occurred with the recalcitrant Colonel Gaddafi in Libya, the country is bombed and international sanctions are applied along with Black Ops like the Lockerbie Bombing being falsely blamed on the country. In Libya’s case Gaddafi eventually capitulated and paid many billions of dollars in so-called reparations and accepted a Rothschild controlled Central Bank in order to stay in power and have the US organised sanctions and other threats cease. (4) For instance the Act establishing the Federal Reserve in the US makes no provision for repayment of any monies borrowed by the US Congress. It only requires that the US pay interest on monies it “borrows” from the Fed. ‘Within the Bretton Woods Treaty, the British Pound was to be removed and substituted by the US Dollar. Within a “Side Agreement” to the Bretton Woods Treaty the Collateral Accounts were to be operated, Administered, and Controlled by the TTTGC (America, U.K. France) as the Allied Powers, but also because the US Dollar was the International Reserve Currency and therefore operated out of NYC and DC. via the Federal Reserve and US Government. Shortly after the Federal Reserve System was introduced. This is legally a separate entity to the Federal Reserve, and introduced into various countries in Europe as well as America. It was this Federal Reserve System that was to partly utilise the Assets of the Collateral Accounts.